I will be teaching at the Custard Factory, Birmingham (UK) on July 2nd as a part of Resource, an ongoing training year for ministry in the emerging culture. Jonny has talked about it already and has more details. Its open to anyone who would like to learn. 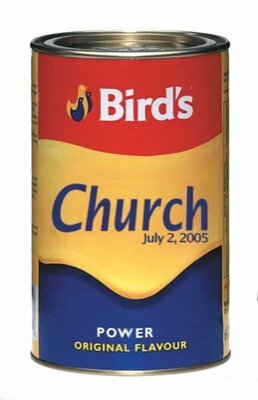 | was thinking about the emergent behavior of custard, and also baking powder (also invented by Alfred Bird) and how it relates to creating church in the emerging culture. Jesus had a lot to say about leavening agents and the Kingdom so this should be a good place to discuss it. Reading Roland Allen’s book (Spontaneous Expansion of the Church and the Causes that Hinder It- PDF) will help. And yes, the building is the original Bird’s Custard factory which is now one of the largest art villages in Europe. Should be fun!!! Anyone currently involved or wanting to get involved in fresh expressions of church, mission in the emerging culture, or church planting who wants to meet some others who share the same passion, and get a bit of encouragement and input. I have been reading your blog for a while and I doing some God stuff in Washington, DC. I am a woman and I am wondering if you could could point me to some other women who are involved with Emegening church. Seems like there aren’t a lot of female voices but probably because, like me, they are not speaking up as much…hmm…anyway, anything you can offer would be appreciated. dont have space to list all the emerging church women who both blog and start churches – I know that there are also a lot of them in USA. Let me just name those in our apostolic/prophetic team and who function as our “team” and family. shannon hopkins works very closely to us. and then the list becomes hundreds so i will quit there. Next Post (n)	Who is Your Church?